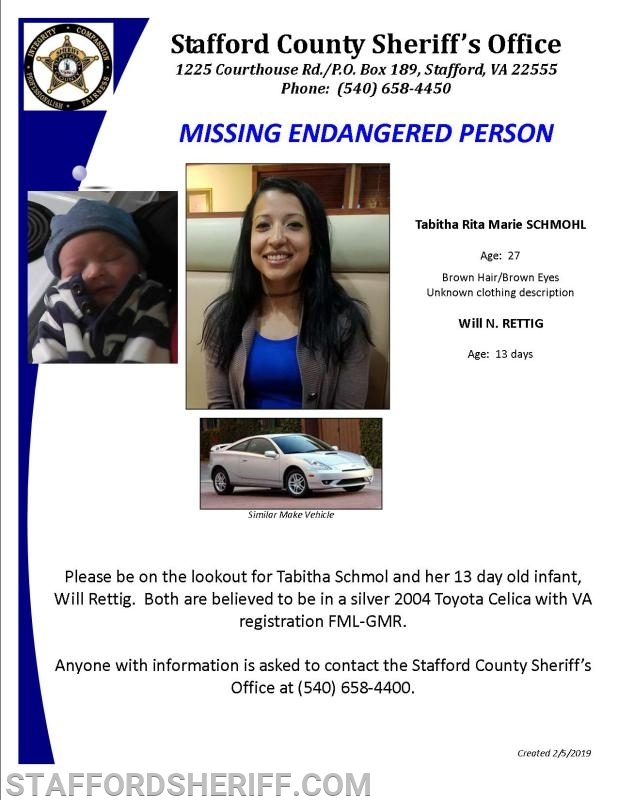 UPDATE: Tabitha Schmohl and her infant have been safely located by the Stafford County Sheriff's Office. Thank you to the public for your assistance. ORIGINAL POST: The Stafford County Sheriff's Office is seeking the public’s assistance in locating a missing endangered person. Tabitha Schmohl was last seen this morning with her 13 day old infant son, Will Rettig. Both are believed to be in a silver 2004 Toyota Celica with VA registration FML-GMR. Anyone with information is asked to contact the Sheriff’s Office at (540) 658-4400.